On this music tour to Italy we are celebrating several giants of the music world, including Monteverdi, the father of Opera and Verdi, the most dramatic composer of the Italian operas. Learn the secrets of violin making in Cremona, the charming city of Stradivarius, travel to Parma, a pleasant city with a touch of Austria, as the former "Petite Capital" of the Duchy of Marie Louise of Austria. The city is famous for its opera house where several of Verdi's works were premiered and also for Toscanini, whose modest birthplace shows many important memorabilia form the famous conductor's life. Visit nearby Roncola, the house where Verdi learned to love music in his mother's womb and Bussetto where he created his first famous operas. We included lunch for you in a typical pub where delicious prosciutto and bubbling wine is servedaccompanied by Verdi's operas. Continue as an optional tour with visits to nearby medieval castles. Lunch at the unique Verdi Museum tavern of Salsamenteria Baratta in Busseto center while listening to Verdi's most popular music and arias and tasting his favorite vines. Private guided walking tour of Cremona including a visit to a violin maker shop whre you will be introduce to the art of violin making. 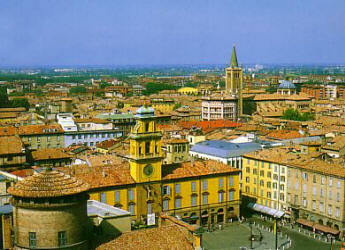 Entrance to the Stradivari Museum, Civic Museum, Palazzo Comunale and the Historical Collection of Ancient Instruments. Optional visit with tasting at the Parmesan cheese factory: Euro 15 per person. Extensions to other cities in Italy or in other European countries are available on request!